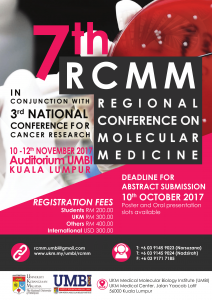 The 7th Regional Conference on Molecular Medicine (RCMM) in conjunction with 3rd National Conference for Cancer Research (NCCR) was held on 10th-12th November 2017 at our very own UMBI building. 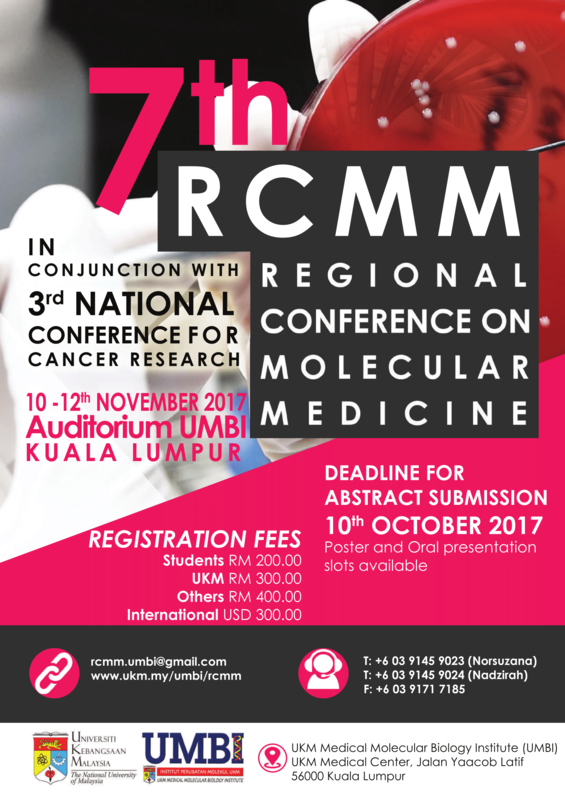 This conference is a biennial event organized by UMBI since 2005, bringing together researchers, academics, postgraduate students and industry players in the field of medical molecular biology from local and abroad. Its main purpose is to share the latest scientific findings as well as to highlight the latest and advanced technologies in molecular medicine and cancer. 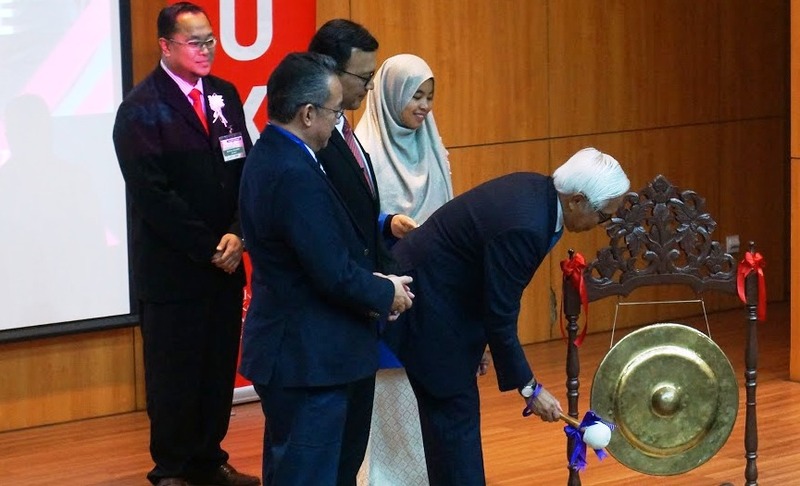 The conference was officiated by Professor Tan Sri Dr. Zakri Abd Hamid, Science Advisor to YAB Prime Minister of Malaysia, and hosted a total of 31 speakers with expertise in various fields of medical and cancer research, from Malaysia, Australia, Thailand and Singapore. A total of 170 participants participated in the conference. In addition to attending plenary sessions and symposiums, participants also had the opportunity to present their research findings through posters, and 12 young scientists under 35 years old presented their research findings in an oral presentation for the RCMM Young Investigator’s Award. The Best Poster Award was won by Dr Jayakumar Rajarajeswaran (University of Malaya); while Siti Nurmi Nasir and Nadiah Mohd Nawawi (both from UMBI) won the Young Investigator’s Award for Cancer and Non-Cancer category, respectively. Another interesting agenda during the conference was the “Meet The Expert” session, which gave participants (especially students and young scientists) the opportunity to sit face-to-face, ask questions and discuss in a relaxed environment with leading scientists about research or issues related to molecular medicine. The conference was also supported by 10 molecular biology companies participating in booth exhibitions held in the lobby of UMBI building.